Kashmir, rightly quoted as a Paradise on Earth, is a perfect destination for travelers of all kinds. The adventure seekers, nature admirers, camping enthusiasts, trekking buffs, history finders, people in love – Kashmir has something for everyone. 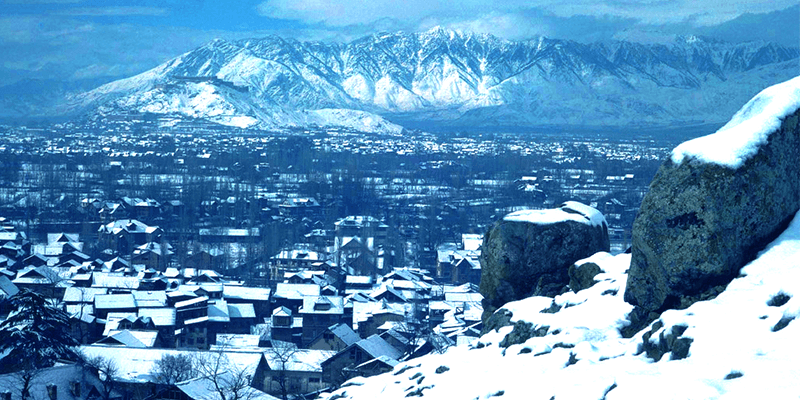 Places to visit in Kashmir remain crowded all through the year, as this beautiful state is a haven for all things nice! And Kashmir tour packages, inevitably start from the state capital of Srinagar. 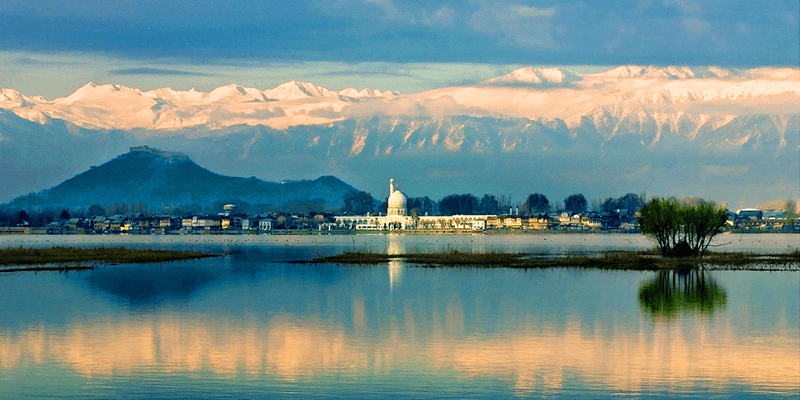 Srinagar is the first taste any traveler has of Kashmir’s supreme beauty. 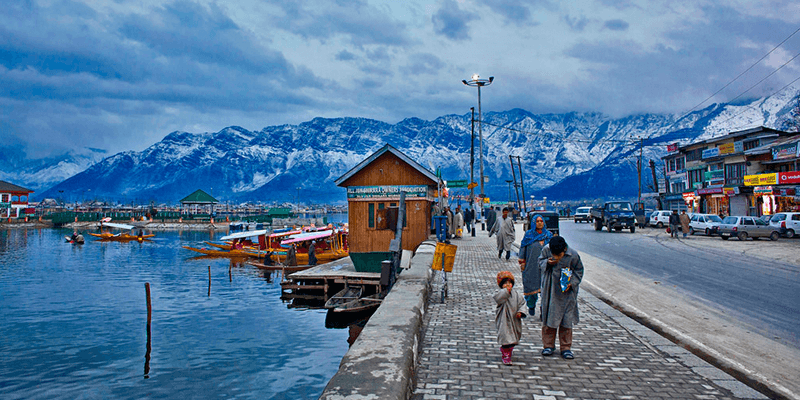 So, we bring you a list of not-to-miss experiences and Srinagar sightseeing options in this blog. Srinagar can be easily reached by train as well as hiring outstation cabs from Delhi and other nearby states. If you prefer a train journey, then book tickets to Katra or Jammu railway station. If you are an adventure lover, then this would be a great way to kick off your Srinagar sightseeing. Trekking up the Shankaracharya Hill is a memorable experience. It allows the travelers a sneak into the tranquil side of nature and will take you to a world which is fresh and beaming. There are two trekking routes in close vicinity – Hari Parbat and Shankracharya Hill. But we would recommend Shankracharya Hill. This hill earlier went by the name of Takht-e-Suleiman or Throne of Solomon. The revered Shankaracharya Temple, dedicated to Lord Shiva and named after Sri Adi Shankaracharya, is perched at the top of this hill. The accent to the hill is about 7 KM long and once you reach the hill stay ready to climb another 100 steps to reach the actual temple. The views from atop this hill will blow your mind away! Choose a good vantage point and spend some time just admiring the view of Srinagar city below. 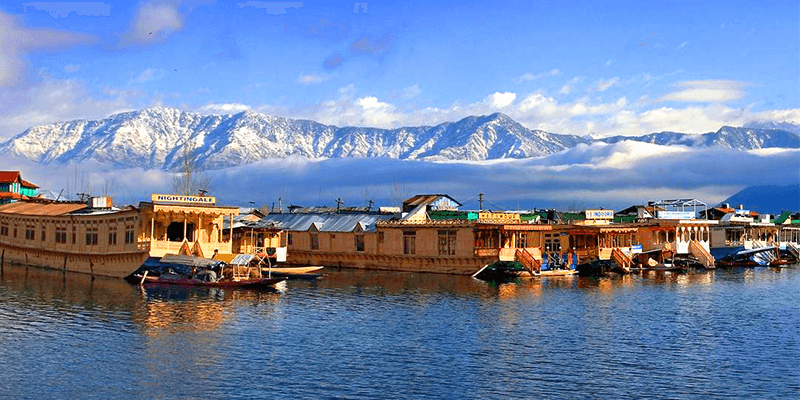 Though there are plenty of great hotels in Srinagar, but nothing can offer the level of thrill as a stay in one of the houseboats in Srinagar. When in Srinagar, you can never be far from the Dal Lake! This 18 SQ. KM long lake is the lifeline of Srinagar dwellers as Kashmir tourism. And the lake is filled with many floating houses, known as houseboats. The rooms in these floating houses have all the amenities that a modern hotel would. As an added service you can experience the Kashmiri way of life and their fabulous cuisine. Not only that, sit at the balcony of the houseboat and you will find vegetables, groceries, fruits and much more being ferried on the lake. And of course, you can’t just stop staring at the beauty of this lake all the while! This experience is usually partaken during or right after a stay in Srinagar houseboats. The Shikara ride allows you to explore the entirety of the lake. The boatman would take you around the best spots of the lake in a gorgeously decorated Shikara. There are some areas around the lake from where you can have a mesmerizing view of the Himalayas. 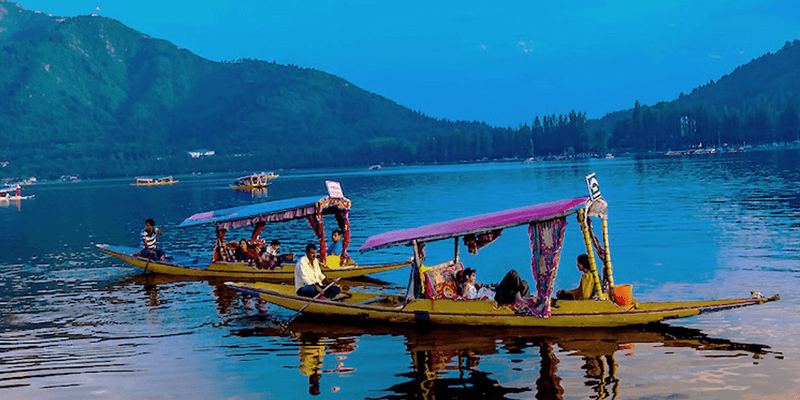 You can float past a garden of Lotus flowers or shop some at the Dal Lake’s floating market! Hourly rates of Shikara rides are INR 400, you can get in true travel mood by hiring some traditional Kashmiri outfits (which usually cost INR 150) before boarding the Shikara! If you have always marveled at the Tulip Gardens of Holland, you are sure to fall in love with this garden. Situated at Cheshma Shahi Road in Rainawari, the beautiful Indira Gandhi Memorial Tulip Garden is a dream destination for the gardening lovers as well as the shutterbugs. This garden was brought to the limelight after it featured in the yesteryear classic – Silsila. The mere variety and colors of Tulips decorating this garden would leave your eyes craving for nothing more. 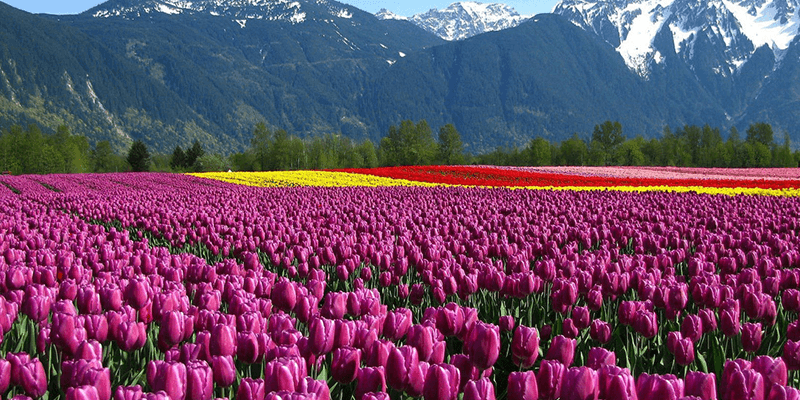 Spread across 30 hectares of land, this is the largest Tulip garden in Asia! The garden is open on all the days from 7 AM to 7:30 PM. The entry fees charged for this grand experience is a mere INR 50 (for adults) and INR 25 (for children). If you visit Srinagar by air, you will realize how beautiful the city looks from the skies and its beauty looks magical when you paraglide above the city! Memorable paragliding trips are organized at Pari Mahal. Once you take off from the hilltop, you will feel the cold and fresh mountain breeze wiping away all the pent up exhaustion. As you move ahead you get a chance to get a bird’s eye view of the gardens, lakes and surrounding mountains that decorate Srinagar. 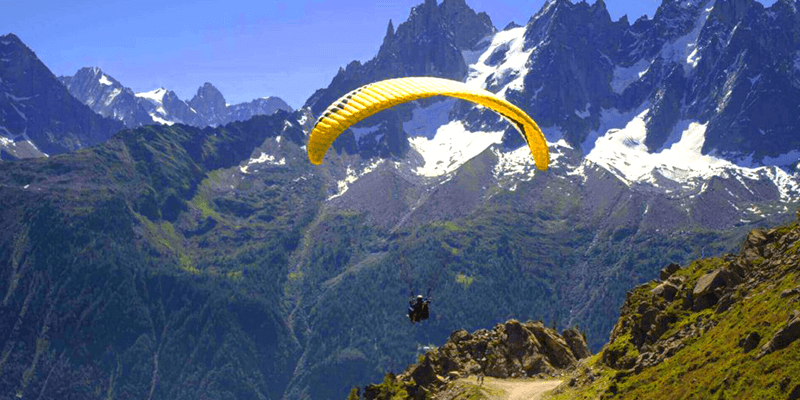 While the duration of the paragliding tour depends on expertize of the traveler, it is a not-to-miss experience while tripping Srinagar. Paragliding tours are conducted on all days from 8 AM to 6 PM. While in Srinagar, you will feel a strong presence of religion. Various mosques, temples and other religious places will entice you. 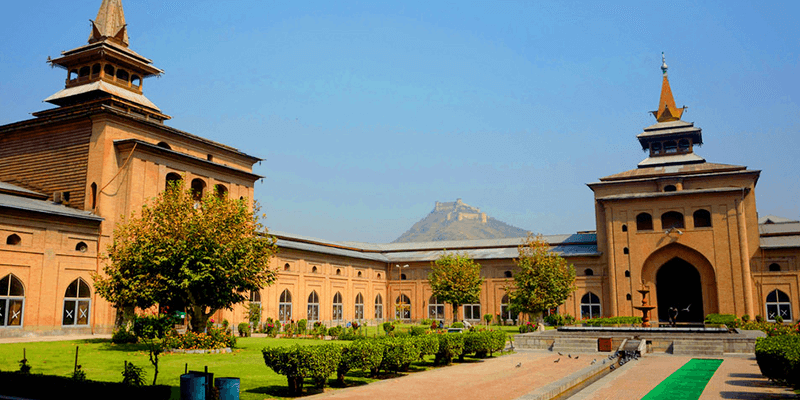 One such place is situated in the middle of the old Srinagar city and stands opposite to the lively bazaars. It is called the Jamia Masjid. You will experience a certain amount of peace and tranquility as you walk into this mosque. But what will really grab your attention is the spellbinding architecture with a beautiful courtyard and 350 wooden pillars that adorn the Jama Masjid. Situated at Nowhatta Kathi Darwaza Road that mosque is open between 3 PM and 7 PM on all days. 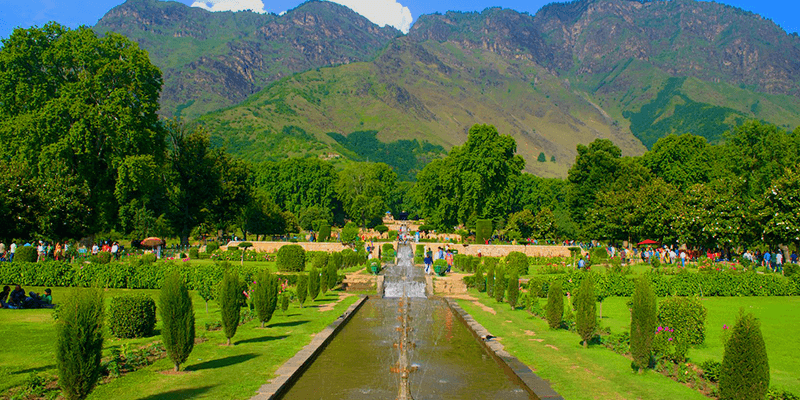 The Mughal Gardens of Srinagar are the foremost places to visit in Kashmir and feature in every Kashmir tourism itinerary. The city is decorated with many such beautiful gardens and the most gorgeous among them are Chashme Shahi, Shalimar and Nishat Gardens. These gardens are blessed with the nature’s best gifts and a walk through them throws a light on the times gone by! Apart from the array of colorful flowers and trees laden with fruits, the Mughal Gardens of Srinagar are also known for their lawns, fountains and mountain backdrops! Islamic shrine of Dargah Hazratbal is situated on the banks of Dal Lake. With its lush green lawns and a panoramic surrounding, the shrine is a crowd puller on all days. If you are seeking some peace and calm then this is the place to stop and pray. Another attraction of Hazratbal shrine are its vantage points that allow the travelers to get panoramic view of Srinagar’s splendid beauty! Shopping in Srinagar is a shopaholic’s dream come true and you are sure to be spoilt for choices. There are many grand markets in Srinagar; namely Lal Chowk, Badshah Chowk, Residency Road, Polo View Market, and Raghunath Bazaar. But we would recommend Lal Chowk largely due to its variety and stocks. The streets of Lal Chowk are dotted with shops and vendors offering Pashminas, papièr mâchè bangles, Aari work sarees and suits, carved wooden boxes, embroidered scarves, wicker baskets, silver jewelry, carpets, spices, Phirans and a lot more. While at this market do care to buy some walnuts and wooden souvenirs for your family and friends. 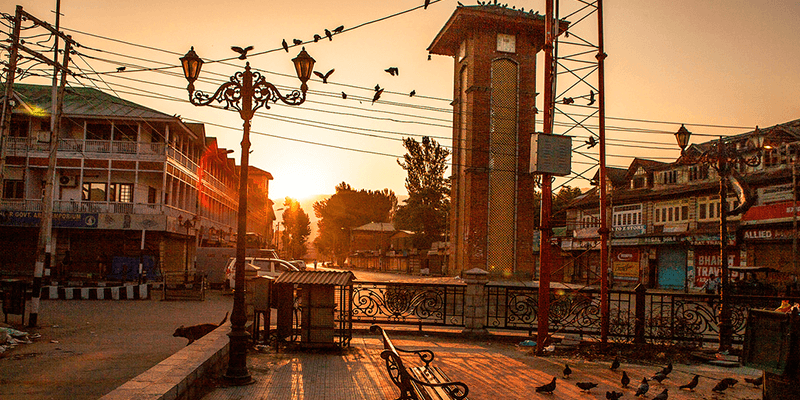 Sunsets in Kashmir are marvelous and for the best experience head straight to Boulevard Street in the late evening hours. Take a good vantage point and soak in the yellow, red and orange hues of the setting sun. The last rays from the setting sun give a magical makeover to the Kashmir valley! 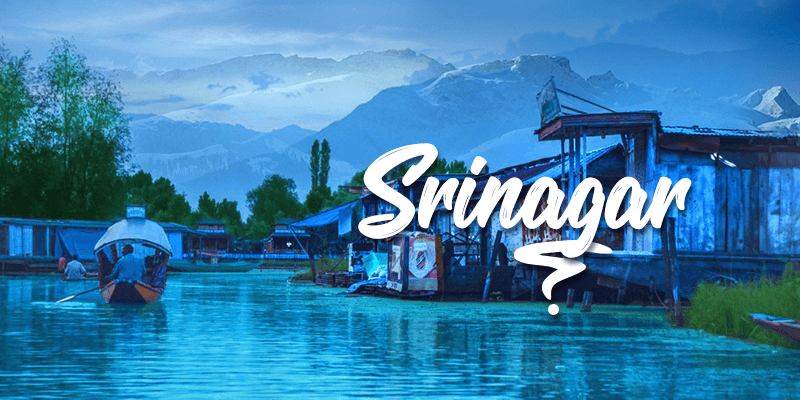 You might have already noticed the overuse of ‘beauty’ through this blog, but even that is not enough to depict the true beauty of Srinagar. So, visit this wonderland as soon as you can!